Baton Rouge, LA – November 17, 2014 – Commuters in Vancouver, BC can now shop while they wait for the train, thanks to a new interactive campaign from SHOEme.ca, a Canadian owned online shoe retailer, and Lamar Advertising Company (Nasdaq: LAMR). Lamar Advertising of British Columbia is pleased to announce the launch of British Columbia’s first virtual shopping wall mural in Vancouver City Station. "The concept of a ‘virtual shopping wall’ in a transit environment has been executed in other international transit markets, but this is a first for Vancouver transit,” said Byron Montgomery, Regional Vice President and General Manager of Lamar Advertising. “We are thrilled that SHOEme.ca embraced this interactive concept in OOH marketing and partnered with Lamar to make it happen." The SHOEme.ca virtual shopping wall mural gives shoe lovers the opportunity to make mobile online shoe purchases on the go through product-specific QR codes posted on the mural in Vancouver City Station. 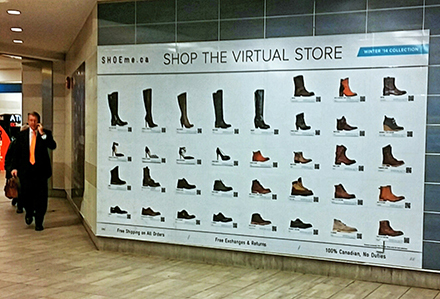 The SHOEme.ca virtual shopping wall mural stands prominently in a high traffic location in Canada Line's Vancouver City Station. Vancouver City Station's over 97,000 average weekly riders will have an opportunity to make mobile online shoe purchases on the spot through the use of product-specific QR codes posted on the mural. Commuters can simply scan the QR code on the mural using a smartphone and complete the transaction on their mobile device in less than a minute. The SHOEme.ca virtual shopping wall campaign will run on a long term basis. The footwear lineup will change regularly to reflect the latest fashions of the season with simple vinyl replacements. "We are excited to be working with Lamar to launch our first SHOEme.ca virtual store,” said Curtis Petersen, Chief Marketing Officer of SHOEme.ca. “For an ecommerce retailer, this new installation gives SHOEme a way to not only build awareness, but to drive online transactions as well." The SHOEme.ca campaign started at the beginning of November and will run on an ongoing basis in 2015. A few years ago, out-of-home advertising was still primarily used by either big, traditional brands or local businesses. 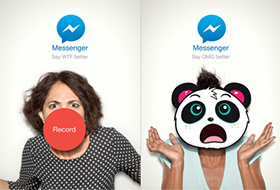 But as technology becomes more engrained in everyday life, companies like Facebook, Foursquare and a crop of startups are putting new twists on outdoor advertising to build brand recognition and drive app downloads.